False eyelashes are something I've now started wearing on a daily bases. Eyelure work really well for my eyes and their range means I can try many different looks. These are the ones I use. I use these on a daily bases. I'm fortunate to have quite long eyelashes but the amount of time it takes to get these with mascara is just a bit too much effort. With these falsies it I can achieve an even better look in half the time. Make sure the wear liquid eyeliner with these just to hid the glue line. No one can even tell I wear them! They just give that added umf. So I use these on those in between occasions. You know what I mean, dinners, events which aren't clubbing etc etc ( I use these on videos) They are more obvious that there fake but only when people are popping into your personal bubble anyway, but who cares! I think they look damn good. Evening only please Ladies with these ones. I think these are better for my eyes then the full ones because of my eye shape. I've followed my natural eyelashes' length and since these are longer at the edges I've opt for lashes that will enhance this a little.....moderate amount.....a lot. Big up to my bro for getting these for me. You've probably read about fifty reviews of this already telling you its amazing! Does what it says on the tin! I can confirm that these reviews are correct. But why should you spend 16 of your precious pounds on this eye shadow primer? Surely your regular primer works. No. No it does not. Not like this does. I'm not sure how those clever chemists at urban decay did it but using eden makes your eye shadow look like the colour it is in the palette, instead of a wishy washy one that doesn't really represent the look you were going for. It makes your shadows last a lot longer too which means you can buy much cheaper ones too. Investing in this primer will make your other pieces last longer too, meaning you can use less of those. Those 16 pounds seem to be stretching quite far now. Not only that but I would most definitely use it as an eye shadow in itself. Its a pretty neutral. I feel like I am never in a position to ever advise anyone about eyebrows. I have made so many unforgivable mistakes in the past that my right to ever comment on them has been taken from me. However, I will write about this pencil. So my hair is blonde, not naturally as blonde as it is now, but a very dark blonde. For some reason my eyebrows are very, very dark. You may think ' Blonde hair and dark eyebrows is such a good look! It works so well on Rita Ora and Cara'. I certainly do not have either of their faces or complexions so no. On normal folk such as myself it is not a great look. There is a point to this story and that is I find it so hard to get the colour right for my brows! With this pencil alone I still have not achieved this. BUT when I use this pencil and some Bobbi Brown eyeshadow in Slate then I do achieve this!!! Finally. If you dye your hair blonde but have darker eyebrows then I recommend this product in the taupe. If your blonde with lighter eyebrows then I still recommend this product. Its a twist pencil but its in a retangular shape and so will not snap easily! Knowing it will last longer and not break makes it easier to break away from the £20 this pencil will be costing you. But to finally have my eyebrows sorted I'm very happy to pay £20. The only thing I would say to Smashbox is lose the gel which comes the pencil on the other side. It's not very good and I'd rather have a longer pencil. And Ta Da! Those are my reviews for my new beauty products. Let me know if you've tried any of the above and what you think! 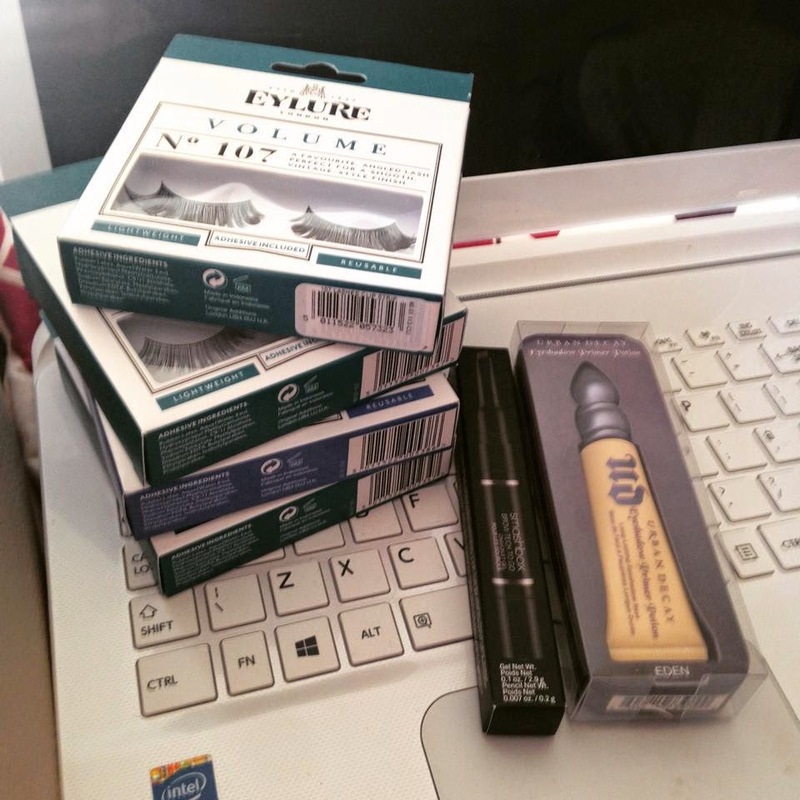 I have the UD eyeshadow primer in Eden too and I love it more than the original!